Dr. Gary Chapman believes that there are five different ways that people express love: words of affirmation, acts of service, receiving gifts, quality time, and physical touch. He refers to these as Love Languages. This book is all about learning to love others in their own love language, the way that they feel the most love. This is all about improving the relationships with everyone you know. This is the singles edition, but you do not have to be single to read it and benefit from it. This book was written after the huge success of his first book regarding the 5 love languages in regards to marriage. This book simply focuses on all relationships, and not just romantic ones. There are also questions for thought and consideration at the end of each chapter. I completely believe in the five love languages, and through the quiz in the book, I have finally discovered mine: quality time. 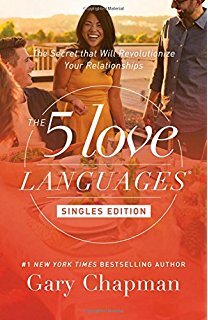 I have been able to recognize the love languages of my friends and family, and hope that I will be able to show love to them more often in their love language. This is actually the second time that I have read this book, and I loved it this time just as much as the last time. I have this 5/5 stars, and I would definitely recommend it to anyone. I read this in the paperback format, and I found it to be of great quality. I enjoyed writing my answers to the quiz, and have also jotted down the love languages of my friends and family so I can remember. This was a very fast and easy read, but still so full of information. I thoroughly enjoyed reading it, and the writing style made it easy to pay attention. *I received a free copy of this book from Moody Publishers as a part of their blogger review program. All opinions are my own. I was not required to write a positive review.